John Davison had his first successful IPO in the mid 1980’s with Ungermann Bass, Inc. Since then he’s had successful acquisitions and most recently acts as Chairman of several companies. As an angel investor and venture capitalist, John shares how his company became fought off competitors such as Microsoft and how to better prepare for those types of situations. John has 2 daughters that were ‘acquired’ by Google. He explains the effect that Google is having on the technology industry and what to watch out for. This is a must listen to interview for anyone looking to make it in the technology field. John M. Davidson, Ph.D., is an entrepreneur and technologist in the communications networking industry currently working as an independent advisor to several high technology startup organizations. 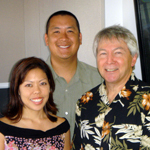 John began his career as a graduate student with the University of Hawai`i’s ALOHA System, the research project that pioneered the concept of shared-access digital channel networking. He served as the University’s liaison to the ARPANET Technical Working Group where he generated a number of early RFCs defining networking protocols and strategies and participated in the design and implementation of the TCP/IP protocol suites. After receiving a Ph.D. in Computer Science, John worked at Bolt Beranek and Newman (creators of the ARPANET subnetwork) in Cambridge, Mass. where he participated in a number of networking advances which helped pave the way for the emergence of today’s Internet. In 1979, John became a founder of Ungermann-Bass, Inc., the networking industry’s first Local Area Networking company. At UB, he served as the company’s Chief Technology Officer and Vice President of R&D, helping to grow the company to 1,600 people and revenue of $400 Million. Ungermann-Bass went public in 1983, and was acquired by Tandem Computers in 1988. In 1993, Davidson left UB to found Network TeleSystems, Inc. (NTS), a privately held, self-funded and profitable Internet Infrastructure company that supplied Internet Protocol software for ISPs, Carriers, and Enterprise customers. He served as Chairman and CEO of NTS throughout its existence and was largely responsible for guiding its product strategies. NTS’s desktop TCP/IP software helped millions of dial-up and LAN users access the Internet in its formative years when the software was sold through OEM relations with companies such as Netscape, Cisco, and IBM, and through branded licensing arrangements with dozens of ISPs worldwide, including Earthlink, MindSpring, and AT&T WorldNet. As the market for dial-up Internet access matured, the company evolved its software to serve the broadband access market where it achieved an 80% market share for its Enternet client software which is still in use by Carriers and ISPs worldwide to govern access by subscribers to their broadband cable and DSL networks. NTS also served the enterprise market with a family of network appliances that provided DHCP, DNS, WINS, and VPN Tunneling functionality. In May 2000, NTS was acquired by Efficient Networks of Dallas, Texas, a leading provider of customer premises equipment (CPE) for the DSL market place. At Efficient, John served as Vice President of New Business Initiatives in the Corporate Development group. Efficient Networks was itself acquired by Siemens in April 2001. Throughout his career John has been a popular public speaker, a capable technical instructor and course leader, and a successful author, publishing, along with many technical papers, the industry’s first expository description of the Internet’s underlying protocols, An Introduction to TCP/IP, an offering in the Springer-Verlag Technical Series that has been translated into both French and Japanese language versions. He is active now as an angel investor in a number of software startup companies, currently serving as Chairman of EzRez Software, WhiteHat Security, Radio Time, and Tingo corporations, and as an advisor to several other companies and to the Pacific Asian Center for Entrepreneurship and e-Business (PACE), a part of the College of Business Administration at the University of Hawai`i.